Next review Everything about the trip has been just fabulous. BookVIP.com you can NOT go wrong! We just returned from an adults get away at this fabulous all inclusive resort. We loved our room, which had an amazing ocean view and was recently renovated. Very clean and the bed was very comfortable. The resort grounds were also clean and well maintained. We felt the resort had a wide variety of meal options and enjoyed all of the food (especially the sushi bar, DaVinci's Italian restaurant and breakfast at Pina Colada on the beach). What really set this place apart, though, was the phenomenal customer service from the staff! Everyone was so friendly and it was hard to leave all of their friendly faces. Jose (lounge), Rita(poolside), Consuelo(beach), Seney(sushi bartender), Luis (sushi server) and Martin (poolside bar) especially made our stay extra special and memorable. I especially enjoyed my coconut drink served by Seney and later decorated by Martin (see picture). Thanks Omni staff BookVIP! 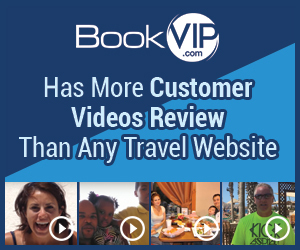 Product or Service Mentioned: Bookvip Omni Cancun Vacation Package. Review #992358 is a subjective opinion of testimonial.